ANT Telecom provides a lone worker solution to connect colleagues to the Council's CCTV control room. Automated communications specialist, ANT Telecom announces it is working with Nottingham City Homes to roll out its lone worker solution to protect workers in remote locations and provide staff with the safety and monitoring device, UrSOSButton. This announcement follows the successful go live of ANT's solution with the Council's CCTV Control Room. The UrSOSButton is a discrete option that provides security and monitoring capabilities to help ensure the safety of the user with simple to use functionality. Pressing the UrSOSButton activates an app on the user’s smartphone that in turn sends an alarm message back to Nottingham’s CCTV Control Room. The alarm message contains details on who raised the alert and their GPS coordinates pinpointing their exact location. The app also initiates a telephone call opening the handsfree mic on the smartphone and enabling operators to eaves drop and pick up important information at the scene so they can assess the best course of action. Operators can also utilise any CCTV they have in the area too. 300 users are already using the UrSOSButton, with further 250 users expected to have the alarm button once roll out has been completed. Nottingham City Homes manages around 27,000 houses in the city of Nottingham. Its Housing Patch Managers (HPMs) deal with anti-social behaviour, harassment and neighbour disputes. They also take part in estate inspections. Working closely with the police, the city council, local tenants’ and residents’ associations and others, Nottingham City Homes aims to improve the quality of life for those living in the community. Ian Rabett, Head of Health and Safety at Nottingham City Homes comments: "We take the personal safety of our employees extremely seriously and want to ensure that we have the best system in place should there ever be an incident, whether they are on their own or with a colleague. Because the CCTV Control Room will often be able to see an incident live, it will be both easier and quicker for them to determine the best course of action, and they can also share live feeds directly with the Police." Additional benefits of the UrSOSButton include low running costs as it works with Smartphones via Bluetooth, thus eliminating additional SIM card costs. It also has a very long battery life and a single battery charge of 45 minutes could last many months and even up to, and over a year depending on how often the button is used. 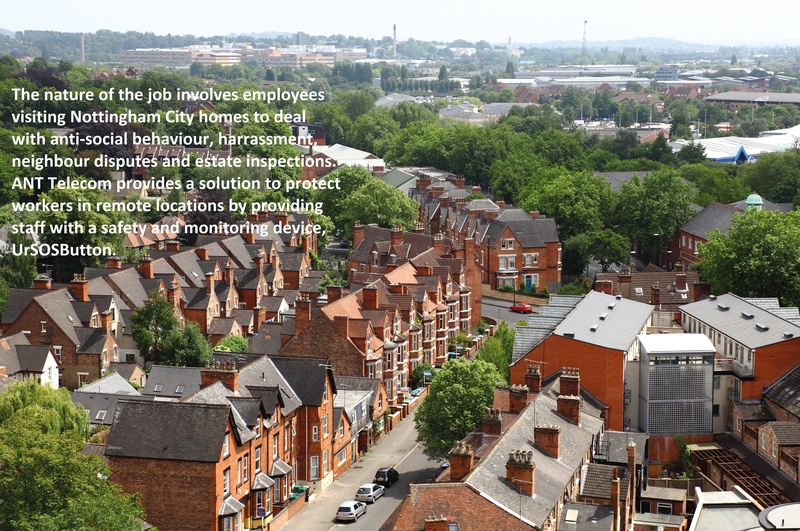 As well as Nottingham City Homes, the Council’s Environmental Health department has 53 members of staff using ANT Telecom’s solution and as Martin Cooke, Principal Environmental Health Officer adds, it is providing reassurance to its employees: “Our team is out across the City investigating noise complaints and assessing new and existing developments for their environmental impacts amongst other things. If we go into the house of an alleged offender or even a client we never know what to expect. Our old system relied on our admin team spotting when we were later back than expected on an electronic whiteboard system. However, if they were busy they couldn’t always dedicate the time to the team’s safety. Nottingham City Homes went live with ANT Telecom’s solution in May 2016 and the Council’s Environmental Health Team went live August 2016.